Certainly the most elusive and desperately sought stamps of this country are the twelve abnormals of the early Victorian Surface Print issues. Those stamps which are Abnormal is some respect to the normal issues are so rare that only a handful of each exist. Of these twelve gems of philately but one stands alone as the most unusual for this stamp is so rare that just twelve copies are believed to exist. Early in 1856 the design of the 9d value was slightly altered and the new plate number four was registered on 27 Feb 1865; the stamps were ready for issue and were placed on sale to the public on 1st December 1865. A 2nd plate number 5 was laid down and registered for use on 24th April 1866. The usual reasons for this 2nd plate were in case cracks and deteriation occurred in the 1st plate the second could at short notice take its place on the press. A single sheet was printed and left imperforate, this was placed in the post office archives as was the case with every issue. Five further sheets may have been printed and perforated. This too was GPO policy and these extra sheets would probably have been issued to the public at a later date providing an abnormal issue, but no such stamps have come to light, so it is my belief that these sheets were destroyed. That, it might seem, was the end of the story. A lone and imperforate sheet filed away in the post office was the only proof of the existence of a plate five and that is the way it remained for many years. Messrs De La Rue & Co were contracted to produce a full run of stamps to cover all weights and destinations in fugitive inks – the greens and lilacs were certainly that and remain today the most difficult to collect with true colours. But this set of stamps was regarded by the public as degrading and monotonous – ‘an outrage and depressing things’. So strong were the reactions that a committee of men were asked to deliberate over the issue. Five men sat for 11 days looked at the situation from every angle and appointed a new issue and so it was that the beautiful and attractive ‘Jubilees’ came about. But this tells us nothing of that lonely sheet filed away for good – have patience, I must tell you the story in full. In 1890 the post office celebrated its Golden Jubilee with various events from one end of the country to the other and it was decided to provide mementoes to members of the stamp committee and others. A small ‘Book’ was designed, it was entitled ‘BEFORE AND AFTER THE STAMP COMMITTEE’ and was embossed with gold leaf and various decorations, there were 4 leaves of card within. The first page was entitled SERIES SURPRESSED BY THE ISSUE OF ARPIL 1884 and contained various stamps issued between 1865 and 1881, the 2nd page entitled SERIES ISSUED APRIL 1884 comprised the greens and lilacs issue together with 1d lilac and 1/2d of 1880. 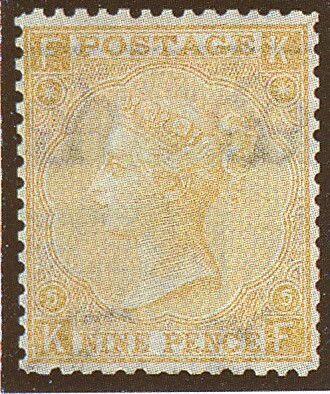 The 3rd page entitled SERIES DETERMINED UPON BY THE STAMP COMMITTEE AND ISSUED JANUARY 1887, including the Jubilee set in full. The last page in this book was printed with details of the committee and the persons that took part. But to return to the 1st page. A 9d was required and a 9d of interest, one that would set the page off nicely – an example from plate 5. And it was that 36 examples were cut with scissors from that only sheet at Somerset House and these were perforated by De La Rue & Co with a line perforating machine in order to turn them into ‘real stamps’. Of the 36 removed, 12 were replaced and stuck back onto the imprimatur sheet, this left 24 copies of which 12 were used in the momentoes; these were stuck in place by simply licking the back. The 12 that were left may well have been ‘lost, mislaid or used’. ‘A History of the Adhesive Stamps of the British Isles’ by Wright and Creeke 1899 states… ‘only a few copies are known but it was undoubtedly issued as a used specimen on the original letter, has recently been discovered’ but no such example has, to my knowledge ever been found. It is impossible however that a few examples were used but this is unlikely. Of these 12 or so copies, another was sold in 1970 at auction and fetched £1500. A copy sold in 1971 at auction, this copy, lettered NK, is illustrated in L & N Williams book ‘Famous Stamps’ 1949 and once adjoined the examples NJ which now resides in the National Postal Museum, London. King GV, a famous collector, had a copy lettered KL this he took from his collection in September 1915 and placed it at auction in order to raise funds for the war. At the sale the stamp reached £280 being purchased by Stanley Gibbons Ltd, who returned it immediately for sale again in a generous gesture. The 2nd time it fetched £245 the purchaser being Mr Frank Godden, the original under bidder to Gibbons. This single stamp therefore bought a total of £525 to the war fund. The Queen has a copy in her collection and certificates that accompany these copies in existence given the opinion that ‘they are soaked off a copy of the pamphlet’. ‘Before and after the stamp committee’. Most examples have part original gum and all give the impression that they have been re perforated, this the result of originally being cut from the imperforated sheet. The examples known today are lettered KF, KJ, KL, LD, LK, LI, MC, MG, MI, NK and NJ. Stanley Gibbons now lists this classic at £18,000 and an example today, if one were to come up would fetch at least 2/3 of this sum. Of the greatest rarity and owned by few. The most unusual abnormal of them all has to be the most desirable of the twelve.